This is adapted from the North Brooklyn Runners workshop from the 24th of October, where we shared our ideas on how to prep for the marathon. As the Educational Member Program Coordinator, I provided framework and ideas; everyone also shared their own great tips. 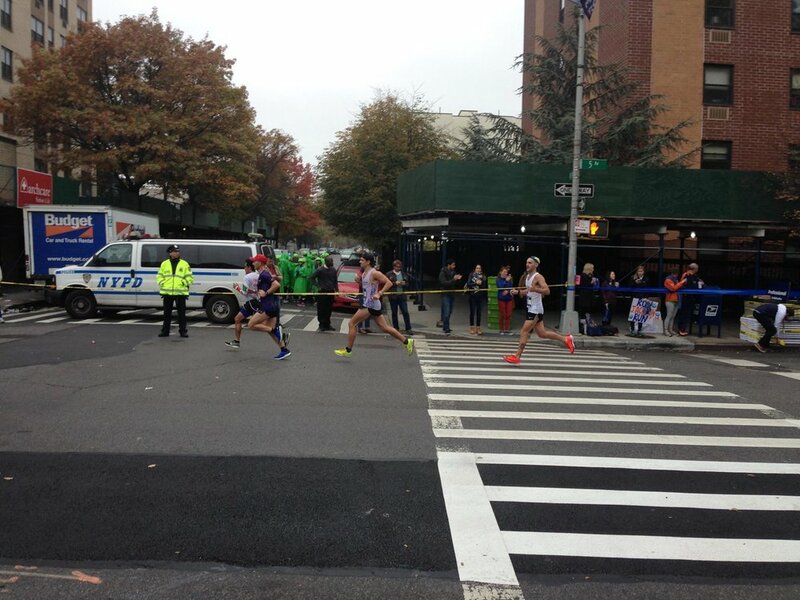 While this is geared towards the NYC Marathon, you can apply many of the tips to any marathon. Ultras break all the rules, so many of them won't apply...unless, of course, they do! You can't cram in all the last minute training. These last two weeks, it's about maintaining your fitness and resting. Don't try anything new, don't exhaust yourself in workouts. Add in a bit of speed if you can - but nothing you won't recover from. Your mileage should be cut way down - 1/3 of peak to even 1/4 of peak. Less is best. If you haven't trained properly, tell yourself that under-training is better than over-training, because with over-training you risk injury. Old school carb deprive/carb load is out. You don't want to carb load with too many carbs. Sorry, you really don't need to eat 18 bagels. Low fiber the day before. If you have stomach issues, pay attention to the fiber you eat. I know a runner who (no joke) does a liquid diet the day before races because of her stomach issues. (Sounds miserable to me, but she swears by it). Try to go earlier so you don't tire yourself out. Buy new clothes/gear is okay; using it race day might not be a great idea. Usually cheap place to buy gels - but so is Amazon Pantry. You pay $6 for a box and you fill it with goods. But don't buy new snacks to try marathon day. No new clothing or shoes for race day! Remember - Daylight Savings - fall behind! Try to get lots of sleep all week long - it will make up if you don't sleep well the night before the race. You should have been hydrating all day long (and all week long really) but stop drinking an hour or two before bedtime. You don't want to wake up to pee 12x. If you can't sleep, try to relax. Meditate, rest as well as you can, maybe even read (but nothing too stressful ... like don't read articles about the current state of politics in the US). Hydrate - but maybe stop drinking an hour or so before you get on the bridge. A little bit of protein for breakfast w your carbs. Some examples: peanut butter on toast or bagel, banana pancakes (Don't those sound delicious? ), maybe even maple pecan oatmeal (small portion, or a smoothie. They have tea, coffee, bagels, & bars - but don't try anything you haven't had before. Keep a disposable water bottle to carry with you into your corral. Use a pace bracelet (available at the expo) to keep track of your pace. High fives are fun, but don't waste time high-fiving everyone. Tell spectators to wear bright clothing or carry a specific balloon or sign - it's HARD to see them, and for them to spot you. Tell friends and family to track you with the app. If someone loves you, they can see you three times! By Atlantic Terminal, go onto 1st ave up in the 90's, then go to 5th ave to see you one more time before they meet you at the finish. Set mini-goals (vs. "I have to run 12 more miles, shoot me...."): the next water stop, the crowds at 1st Avenue; seeing my BFF at mile 20; that huge TV screen in the Bronx; etc. Grab your cup - pinch it twice if you can. If someone wants to cheer for you, tell them chances are, you might be choking on water right after the aid station, so they shouldn't wait right there. Get your calories in early. 100-300 calories is recommended every hour. Most people take a gel every 45 minutes or so (and take it with water). Send a friend to the Bronx - helps to have someone to look forward to. Last mile feels like forever, but the crowds at the bottom of the park ROCK. Don't look at your watch at the finish - it will ruin your finishing photo (and how can you get your photo on the bus then??). The will have your exact time online by the time you're ready to look anyway. Have your family meet you in the family meeting area. If you have a drop bag, add some sandals, socks, and a complete change of clothes. Also, add a tasty snack with some protein if you are picky or if you want something more delicious post race. Change your clothes if you can or at least get that wet sports bra off. Go run the next day. You will hate me for saying it, and it can be the slowest run you've ever done (seriously, 16 minute miles is fine), but just get out there and DO IT. You'll get some of that crap out of your muscles and feel better. Then, take off the next week if you really want. You will want to eat everything in sight - the next day too. Protein helps with muscle recovery. Try to eat 15-30 minutes after you're done - something with protein. Get lots of sleep. You just trashed your body and your immune system is shaky - get lots of sleep. The engraving on your medal the next day is pretty freaking cool. Pick out your next marathon!!! !